The Duterte administration will soon launch the Philippines’ biggest infrastructure projects in the country’s history to propel economic growth in the next half-decade. Adopting the mantra of “build, build, build,” infrastructure projects such as roads, bridgest, mass urban transport and alternative green city solutions are among the focus of key investments by the Philippine government. The projects are aimed at addressing traffic congestion, inadequate and outdated transport facilities, reduce air pollution and lack of healthy liveable communities. The current administration is foreseeing that increased infrastructure spending is the best move forward to improve the lives of the Filipino people by generating massive investments, creating millions of jobs and reducing the prices of commodities. Lead infrastructure agencies are coordinating to build such new facilities. The National Economic and Development Agency, Department of Transportation, Department of Public Works and Highways and the Bases Conversion and Development Authority are crafting the Duterte Infrastructure Plan. In three to five years, new and better roads, bridges, railways, rehabilitated airports and a new metropolis are envisioned to benefit the Filipino people. The Philippine Institute for Development Studies 2017 National Expenditure Program cites that in the first year of the Duterte, the infrastructure spending accounts for 5.4 per cent of the country’s Gross Domestic Product, the highest among the past seven presidents dating back to the Marcos era. 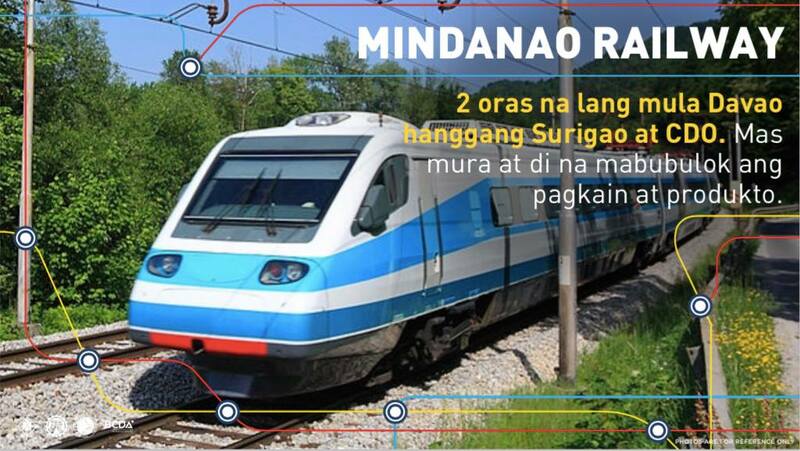 • the Mindanao Railway which will provide the much-needed connection of people and goods across Mindanao. • the NLEX-SLEX Connector Road which will reduce travel time to 30 minutes going to Alabang from Balintawak. For its part, the BCDA is also eyeing big-ticket projects in Central Luzon and Metro Manila such as the smart 9,450-hectare green city that will be a long-term solution to traffic congestion in the Metro.